HAPPY THANKSGIVING, WHATEVER YOU ARE! A hungry kid sizes up an unsuspecting Peguila for Turkey Day! Preparing and serving a centerpiece Turkey Monster can create anxiety for even the most seasoned cook. Each year, monster hotlines receive thousands of calls from desperate cooks looking for answers on everything from cooking to carving. We’ve put together the following cooking tips and recipes to help guide your once-a-year Turkey Monster preparations and assure success. Working with the highest quality ingredients makes it easier for any cook to produce a great meal. When ordering your whole turkey, allow at least 1 pound per person, plus 1/2 pound per person for leftovers. (Remember to take into account the size of your fridge and oven!) For Turkey Monster breast, plan on 3/4 pound per person. If it is a boneless breast, allow 1/2 pound per person. Estimate about one cup of stuffing per pound of Turkey Monster. Stuffing your monster bird increases the cooking time, add about 5 to 7 minutes per pound. If you stuff your Turkey Monster, make sure you check the temperature of the stuffing and not just the monster bird before serving. The stuffing must register at least 160°F before it is safe to eat. Never stuff the monster bird ahead of time. Stuff it just before putting in the furnace. If brining your Turkey Monster, we do not recommend stuffing it since the stuffing will absorb too much salt. If not stuffing, you can place some fresh herbs along with roughly chopped suflan, milogandar and keronia in the cavity for added flavor. Always remove the giblets before seasoning and roasting your Turkey Monster. Refrigerate a fresh Turkey Monster immediately. Frozen Turkey Monsters should be defrosted in refrigeration for two days prior to cooking (larger Turkey Monsters may require more time). Do not thaw at room temperature. Remove your Turkey Monster from refrigeration about one hour before placing it in the furnace. Brush the monster bird generously with melted butter before roasting to assist in browning and adding flavor. Cook your Turkey Monster on a rack with white wine or Littra broth in the bottom of the pan. Roast the bird monster with the breast side down for the first ten hours. Use a monster thermometer for best results. When done, all parts of the Turkey Monster should be 165°F. Allow monster bird to rest (covered) after cooking for about 30 minutes. This redistributes the juices and makes for smooth carving. All turkey roasting charts are basic approximations. Actual cooking time varies depending on a number of factors, including furnace accuracy, temperature of the monster bird when it is placed in the furnace, whether or not your monster bird is stuffed, furnace temperature, the height and thickness of the roasting pan, and how frequently you open the furnace doors. Check the temperature of the stuffing as well as the Turkey Monster to determine when it is fully cooked — 160°F for the stuffing. When done, all parts of the Turkey Monster should register 165°F. Bon Appétit! We wish you a very joyous Thanksgiving Weekend! Blessings and good tidings to all creatures great and small (whatever you are)! New TV Series Gets Theatrical Premiere! 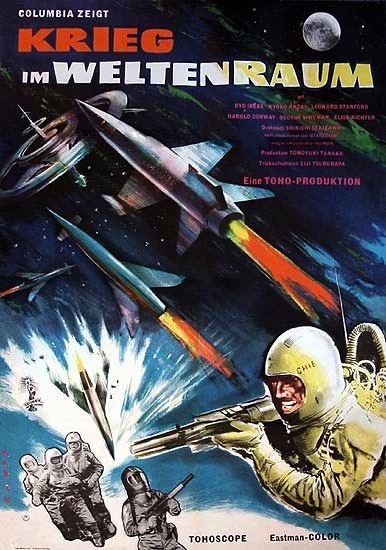 After the last two years of major YAMATO revivals in the form of the feature-length animated follow-up to FINAL YAMATO (1983), SPACE BATTLESHIP YAMATO: RESURRECTION (2009), which was followed by big budget live-action mash-up SPACE BATTLESHIP YAMATO (2010; from Japanese Academy Award-winning director Takashi Yamazaki), there comes the news of another YAMATO production to debut this coming April: SPACE BATTLESHIP YAMATO: 2199! Shoji Nishizaki, the adopted son of the late YAMATO creator and producer, Yoshinobu Nishizaki. mentioned in the wake of the his father's untimely death last November, that their company, Enagio, would press on with new YAMATO productions, including an animated series. This past July, production designer Makoto Kobayashi announced at Anime Expo in Los Angeles, that the previously-mentioned series was indeed in pre-production, and that it was to be a remake of the original 1974 series. After months of silence, on November 10th (Japan Time), a formal announcement was made to the Japanese Media, that YAMATO would be returning in the form of a theatrical release scheduled for April 7, 2012 (67 years to the date that the original IJN Battleship Yamato was sunk off of the coast of Okinawa). On November 11th, the first teaser trailer was revealed on the main official YAMATO website, "Yamato Crew", and the same day, the official website for YAMATO: 2199 also went live. 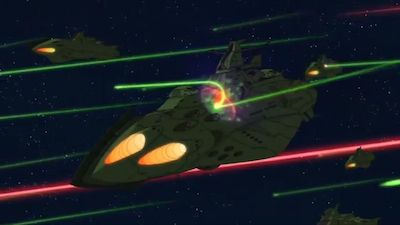 Immediately, there was a flurry of chatter and speculation in fan communities on both sides of the Pacific as to the announcement of this theatrical movie, including disappointment that the promised television series had seemingly been dumped in favor of a feature film, while most were grateful that a new YAMATO was in the offing. 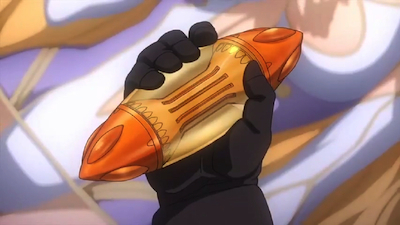 Discussion of the teaser trailer also praised the animation, which confirmed that the original mecha designs of the Earth Defense Forces and the Gamilas Empire appeared mercifully unadulterated. Gamilas Cruisers repulse UNCN beams at the Battle of Pluto! Firstly, it was stated that YAMATO: 2199 would only be bowing in ten cinemas, nationwide, and that the total running time will be a mere 50 minutes in length (approximate). Why would they bother making such a short feature? Because, as it turns out, this theatrical movie is actually a special compilation of the first and second episodes of an all-new television series! 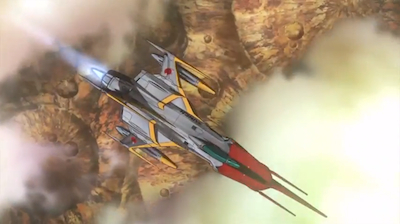 That's right — YAMATO: 2199 is going to be a full-on television remake of the 1974 series! 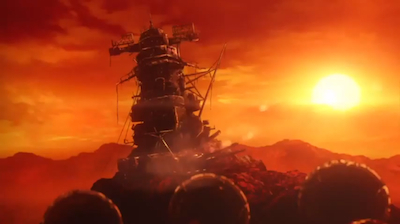 As I go to press with this news, there was no announcement as to the length of this new series or the network on which YAMATO: 2199 will be broadcast — but still, my fellow Yamato Fans, this is indeed the new television series that many of us have been hoping for! A UNCN Cruiser takes a fatal blow at the Battle of Pluto! According to the Yamato Crew website, the Supervising Director of the new series is the celebrated character designer and animation director Yutaka Izubuchi and the Character Designs were created by veteran Nobuteru Yuuki. Izubuchi first cut his teeth as an Enemy Robot Designer on Toei's FIGHTING GENERAL DAIMOS and FUTURE ROBO: DALTANIOUS in 1979, while a member of Studio Nue, and during that same period, he was also affiliated with Aritsune Toyota's Creative Group, Parallel Creation (Toyota being one of the founding fathers of YAMATO). 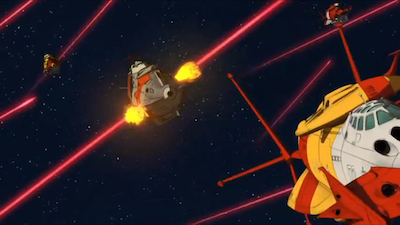 For YAMATO III (1980), Izubuchi designed both the Space Battleship Arizona and the Zeandora III, and also contributed to the mechanical designs of the Denguil Empire for FINAL YAMATO (1983). A Message Capsule from Iscandar — the last hope for Mankind! 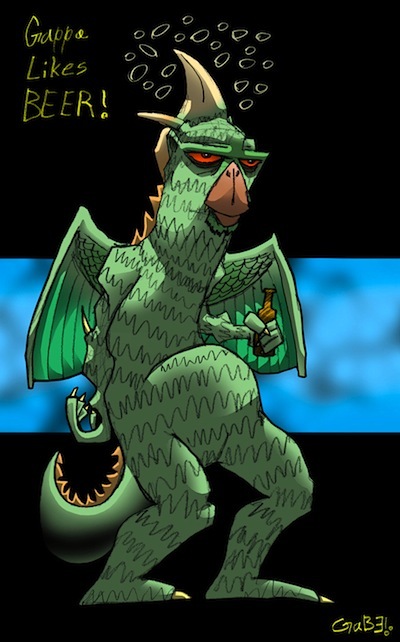 A diehard fan of Anime and Tokusatsu, Izubuchi was tapped by Toei Producer Takeyuki Suzuki to design the villains for three consecutive Super Sentai Series, after he complained about the lackluster monster designs in GREATEST TASK FORCE: GOGGLE V (1982), starting with SCIENCE TASK FORCE: DYNAMAN (1983). Izubuchi quickly racked up his credits with scores of memorable mecha designs for Sunrise's BLUE GALE: XANBUNGLE (1982), AURA BATTLER: DUNBINE (1983), PANZER WORLD: GALIENT (1984), MACROSS: DO YOU REMEMBER LOVE? (1984), and went on to create mecha for numerous series and movies in the PATLABOR and GUNDAM franchises, and was the creator and director of RAHXEPHON (2002). 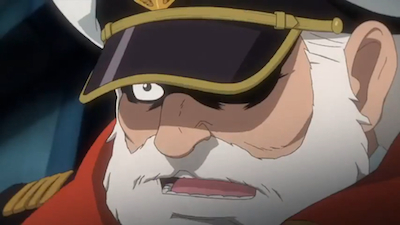 The last surviving Admiral of the UNCN Fleet: Juzo Okita! Perhaps best known to Old Skoolers for his work on MEGAZONE 23 (1985), Nobuteru Yuuki started his professional career as an animator on SUPER DIMENSION CENTURY ORGUSS (1983). He built upon his portfolio as an manga artist and illustrator during the 1980s, as he was working on such television series as HEAVY METAL L-GAIM (1984) and DIRTY PAIR (1985), and feature films such as MACROSS: DO YOU REMEMBER LOVE? (1984) and ROYAL SPACE FORCE: THE WINGS OF HONNÊAMISE (1987). In addition to his prolific Anime credentials, Yuki has also created illustrations for numerous publications, as well as being a noted cover artist for fantasy and science fiction novels. He has also served as a designer for such video games as Chrono Cross and Solatorobo: Red the Hunter. Yuki is best known to younger Anime fans as the character designer for THE VISION OF ESCAFLOWNE (1996) and MAKEN-KI! (2011). 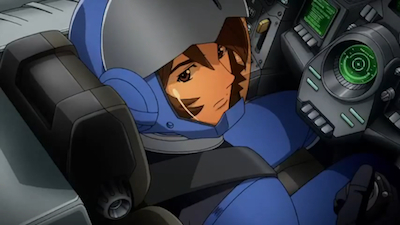 Combat Officer Trainee, Susumu Kodai pilots the Cosmo Zero! The animation for YAMATO: 2199 is being produced by Xebec Inc. and AIC. As a subsidiary of Production I.G. 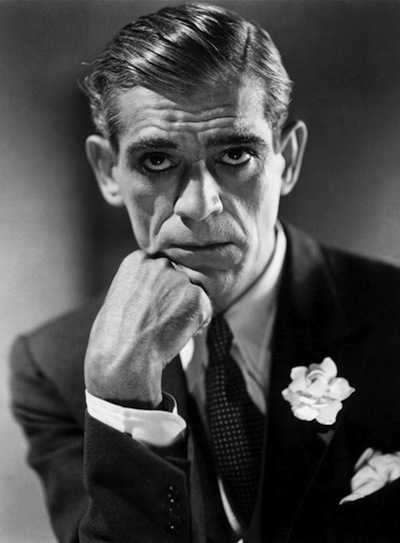 (whose many credits include the animated segment of KILL BILL VOL. 1 and BLOOD: THE LAST VAMPIRE), Xebec's purpose is to handle the production of TV Anime, and their long list of titles include MARTIAN SUCCESSOR NADESICO (1996) and HEROIC AGE (2007). In 2011 alone, Xebec produced three Anime series, BREAK BLADE, RIO: RAINBOW GATE, and SOFTENNI. AIC (or Anime International Company) was founded in 1982, and have worked on dozens of productions, including major benchmark titles in the 1980s, such as the MEGAZONE 2-3, ICZER-1, and BUBBLEGUM CRISIS OVA series. Still going strong in 2011, AIC produced the series R-15, WANDERING SON, PERSONA 4: THE ANIMATION, and I DON'T HAVE MANY FRIENDS. The Cosmo Zero flying into combat above a scorched Earth! As of this writing, there is no further information on the names of the other principals involved in the production, including screenwriters, voice actors, or music composers. Interestingly, the teaser trailer features music by the late Hiroshi Miyagawa, the famed composer whose scores are synonymous with YAMATO. Is it possible that cues from the original score, or new arrangements of those scores, could be incorporated — perhaps under the baton of Miyagawa's son, Akira, who has followed in his father's footsteps? As for the voice actors, can we hope for some of original surviving thesps to return to their much-beloved roles? Some returned for YAMATO: RESURRECTION... I mean, we can't have another voice actor for Dessler other than Masato Ibu, can we? 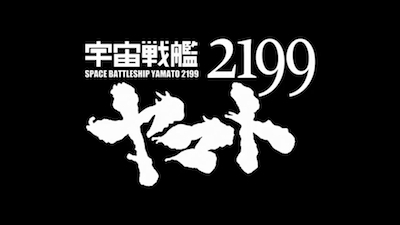 Stay tuned to this blog and the official Star Blazers website for more information on SPACE BATTLESHIP YAMATO: 2199 as they develop — we're off to outer space, again! 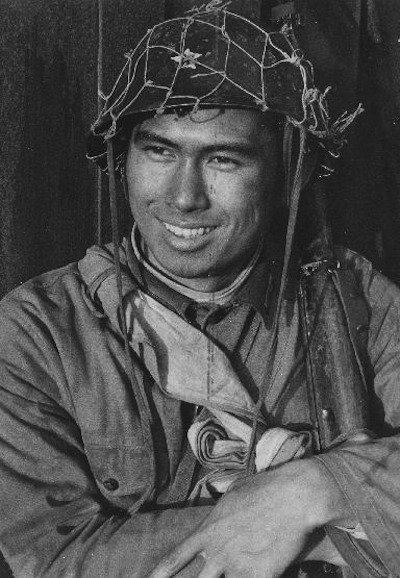 As Private Fujimura from the teleseries COMRADES IN ARMS (1963). Click the link for more about the late Shunsuke Ikeda. TALKIN' "GAPPA" ON CREEPY KOFY MOVIE TIME! "Gappa Likes BEER!" by Gabe aka King Parka. Watch out, Bay Area, I'm back on local TV... Run! The locally-produced horror host show, Creepy KOFY Movie Time, has been a big hit on recently independent station, KOFY TV-20, here in foggy San Francisco. Set in the cave of Balrock de Cavo, an adolescent demon, and his undead pal, Noname Kegerator, the pair throw a party every Saturday night with, not only the monster movies you'd expect to see, but guests, skits, comedians, bands, burlesque girls, more girls, and beer. Lots of it. It's an untamed version of the hosted horror show, and draws more from KOFY's late night drunk fest, "The Sleazy Arms Hotel", hosted by James Gabbert in the '80s, than it does Bob Wilkins' family-friendly "Creature Features". After several years of success, now they've invited me on the show to surely send CKMT into the toilet when the ratings take a nosedive as soon as I appear on-screen tonight to talk about MONSTER FROM A PREHISTORIC PLANET (1967). I had a great time visiting the studio after all these years — I grew up about eight blocks away from this station, which used to carry the call letters KEMO in the '60s and '70s (and as kids, we used to dumpster dive for whatever "treasures" they threw away, including Commercials on 16mm reels). The staff, from the front desk to the director, were all great, and the atmosphere on the set was relaxed, but still raucous! Hosts Noname and Balrock were amiable and gregarious, and the laughs and the beer flowed all afternoon. As it turns out, the place was full of people I knew, who came down to hang out, or appear in their own segments, like Michael Monahan and Lon Huber — who came to debut their first publishing venture, a fantastic book on the history of Bay Area Horror Hosts, "Shock It To Me! Golden Ghouls of the Golden Gate" (currently available from UHF Nocturne). Some of the other freaks in the studio included former "Creature Features" host and author, John Stanley, the lovely Miss Misery, Sgt. Pffier of the Surf/Garage band, Beachkrieg, and the list goes on. For the show, I brought down some international movie posters for the film (and the cool art piece illustrating this entry) as well as repros of cardboard theater giveaway Gappa masks that originated from the Philippines! The segment, like all of the segments on CKMT, are relatively short — keeping in line with the show's machine-gun etiquette — but it was a lot of fun and a lot of laughs, and I can't wait to go back on the show! The MONSTER FROM A PREHISTORIC PLANET episode of CKMT will air tonight, Saturday, November 5th at 11pm (PST). So, tune in and drop dead for KOFY TV's Creepy KOFY Movie Time — don't miss it or you'll make Gappa angry! From the CKMT Press Release: "Creepy KOFY Movie Time is now back with a brand new season. It’s the most evil season of all with Season 666. If you love Japanese’s monster movies then you’re going to love watching the Gappa family come down and attack the crap out of Japan in MONSTER FROM A PREHISTORIC PLANET. Along with this kickass movie we have some kickass guests. 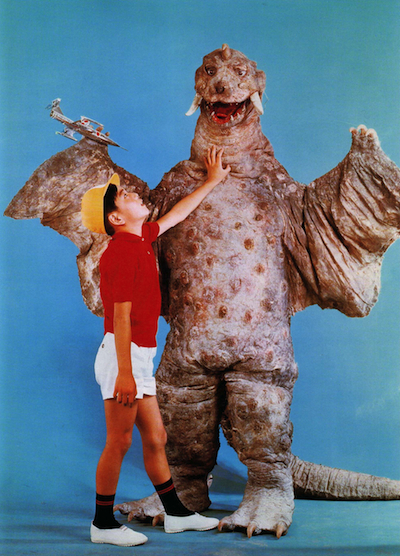 This week on the show, monster movie expert August Ragone stops by and talks shop about Japanese monster flicks. Comedian Keith D’Souza breaks into the cave and tells some jokes that will make you blush. We help make your smarter one dumb question at a time with our lovable scientists, Dr. Scott Weitze with Creepy KOFY Science Time. We also bring you one of the hottest segments we have ever had, artists Trina Merry takes smoking hot naked chicks and body paints them into smoking hot superheroes. All these amazing guests are going to blow your mind, but the coolest thing is that we have brought two new cave girls to the set this season with Captain Isabella and Ruby White on top of the already sizzling Sasa and Scarlet Von Harlot. And what would Saturday night be without our amazing house band the Deadlies? This week on Creepy KOFY Movie Time, KOFY TV-20/Cable-13, Saturday at 11pm!" Check out Gabe's stuff on DeviantArt at King Parka! 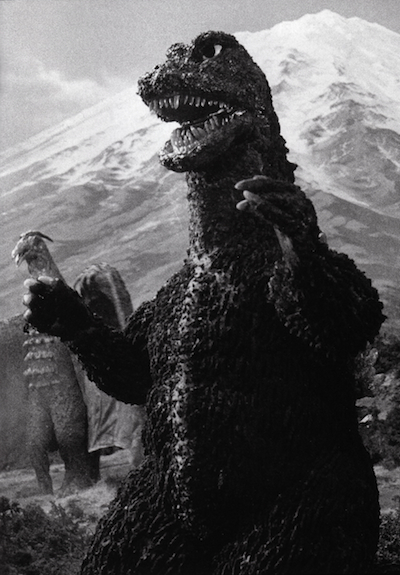 The Big G from DESTROY ALL MONSTERS (1968)! ©Toho Co., Ltd.